As of Thursday, self-defence and defence of one’s property against intruders will always be considered legitimate and no be prosecuted. 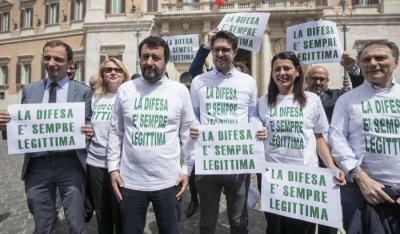 Salvini, who has long advocated in favour of such a reform, was quick to commend the decision. “After years of chatter and controversy, the sacrosanct right of self-defence for anyone attacked in their home, in their bar, or in their restaurant has been sanctioned,” he said. The decision has been widely criticised by leaders of political opposition parties as well as judiciary experts who saw no need for a change to the law and now fear that judges’ authority will be undermined. Leader of the Partito Democratico Nicola Zingaretti branded the new law as “an irresponsible decision,” citing the fact that cases where the current law was abused by defenders were few and far between. He added that the state’s focus should be on better defending its own people, rather than relying on people taking matters into their own hands and creating a “Far West” society in Italy. Salvini’s fellow deputy prime minister Luigi Di Maio also remained wary and was quick to stress that the 5 Star Movement would not endorse any attempts to decrease firearm regulations now the law has passed.